Sometimes responsibilities aren’t clear. Nothing erodes morale and performance faster than a difficult problem that belongs to someone else—or to everyone. When these situations raise their head, it may be necessary to call a group together to sort out who does what. By creating a RACI (Responsible, Accountable, Consulted, Informed) matrix, a group will tackle the responsibility problem directly. A list of roles: Instead of creating a list of individuals, create a list of roles that represent a group of related tasks. For example, “Project Manager”, “Business Analyst”, and “Architect” are better than “Tim”, “Bob”, and “Mary” because individuals can play multiple roles on a project, and multiple people can contribute to a single role. Responsible: This is the doer of the work. Although this person may delegate or seek support from others, ultimately this one person is responsible for doing the work. Accountable: This person is accountable for the work that the Responsible person does, and signs off on the work. 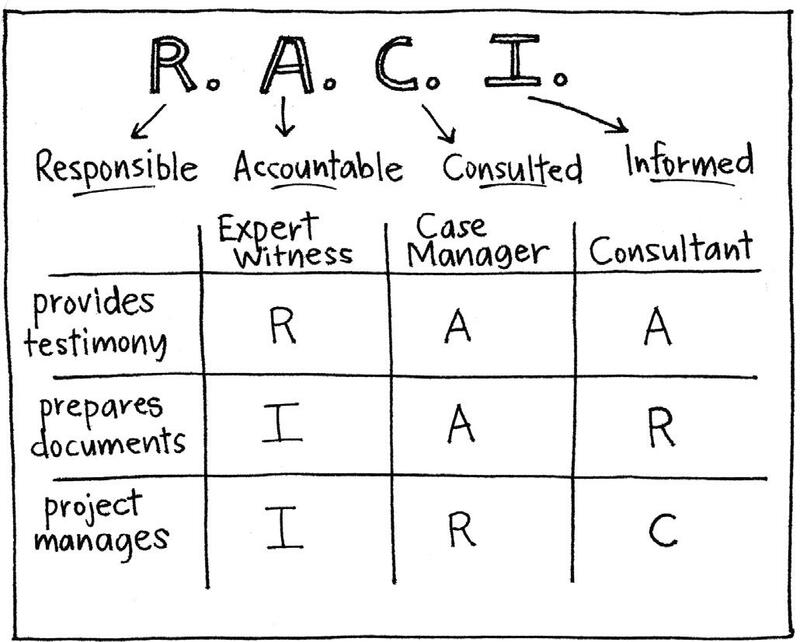 The golden rule of RACI is that only one person can be Accountable for each task. Consulted: These contributors provide input, opinions, and advice through two way communication. Informed: Although they are not contributors, these people are kept up-to-date on progress or completion through one-way communication. In working through the matrix with the group, it is best to follow the natural progression of the work breakdown from start to finish. The matrix is complete when every task has a clear set of responsibilities. The work breakdown is needed to set up the matrix, but don’t be reluctant to change it as the group works through the matrix. In some cases, you may discover that items are unnecessary, redundant, or poorly defined. For example, where it is difficult to assign a single Responsible role, it may help to split the item into two smaller, better-defined pieces. Other items will have no Responsible role at all, and the group may decide to eliminate them. 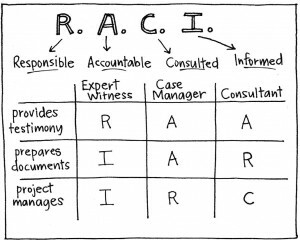 RACI Matrix is based on the same-named diagram traditionally employed in the management of cross-functional teams. Awesome depiction. Activity reinforces the concept well.